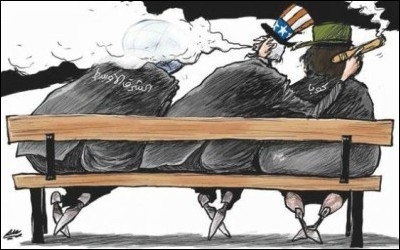 A cartoon in Al-Sharq al-Awsat depicts President Obama befriending Cuba while blowing smoke in the Middle East (whatever that means). The US, under President Barack Obama, has signaled its intent to reduce its presence in the Middle East. The US fought two unsuccessful wars in the region – a frustrating lesson about the limits of its power. At the same time, US dependency upon Middle Eastern energy has been reduced thanks to domestic progress in fracking technology. Moreover, Washington has decided to "pivot" to China, an emerging global challenger, and also to cut defense expenditures, leaving fewer military assets available for projecting power in the Middle East. (For a while during President Obama's tenure, the US had no aircraft carriers in the eastern Mediterranean or in the Gulf at all, an unprecedented situation.) In addition, the American campaign against ISIS has been extremely limited, and has met with little success. Unfortunately, this disengagement signals both fatigue and weakness. American retreat from the Middle East signals both fatigue and weakness. Washington also has desisted from confronting Iran and has gone to great lengths to accommodate it. President Obama's contention is that by completing a nuclear deal with Iran, he resolved one of the outstanding security issues in the region before leaving office. However the deal legitimizes a large nuclear infrastructure in Iran, and ignores the cardinal national security interests of at least two US allies: Israel and Saudi Arabia. The subsequent removal of international economic sanctions – with no reciprocal requirement for any change in Iranian regional policy – positions Iran to reap great financial benefits at no cost. President Obama's Iran policy has occasioned a dramatic change in the regional balance of power, yet Washington appears largely unperturbed. Whereas US policy on Iran has been guided primarily by wishful thinking, the apprehensions of regional actors with regard to Iran's hegemonic ambitions have multiplied in response to the nuclear deal. While Washington claims to be confident that Iran will play "a responsible regional role," leaders in Ankara, Cairo, Jerusalem, and Riyadh see Iran as almost entirely unaltered from its pre-deal state in any meaningful political sense, with the potential to produce nuclear bombs in a short time. The gravest consequence of the US policy of disengagement from the region is the increased probability of nuclear proliferation. Powers contending for regional leadership, such as Egypt, Turkey, and Saudi Arabia will not stand idly by in the nuclear arena, particularly as the US is no longer seen as a reliable security provider. US attempts to convince regional powers to rely on an American nuclear umbrella in an attempt to prevent nuclear proliferation are likely to fail. The emergence of a multi-polar nuclear Middle East, which is a plausible consequence of the American nuclear accommodation with Iran, will be a strategic nightmare for everyone. The gravest consequence of US disengagement is the increased likelihood of regional nuclear proliferation. An emboldened Iran, which traditionally acts through proxies rather than through military conquest, might intensify its campaign to subvert Saudi Arabia, possibly by playing the Shiite card in the Shiite-majority and oil-rich Eastern province. The loss of that province would considerably weaken the Saudi state and might even bring about its disintegration. Iran could use subversion, terrorist attacks, and intimidation of the Gulf states to evict the thinning American presence completely from the Gulf. In the absence of American determination and ability to project force, Iranian superior power might "Finlandize" the Gulf countries. We could also see also the Finlandization of the Caspian basin, where Iran shares the coast with important energy producers like Azerbaijan and Turkmenistan. The Caspian basin and the Persian Gulf form an "energy ellipse" that contains a large part of the world's energy resources. Azerbaijan and Turkmenistan are very fearful of growing Iranian influence. Those countries, which adopted a pro-Western foreign policy orientation after the dissolution of the Soviet Union, might decide to return to the Russian orbit, because Russia appears at present to be a more reliable ally than the US. Russia is fully alive to the potential for a reassertion of a Russian role in the region in the wake of American retreat. To that end, it has taken the major step of intervening militarily in Syria to assure the survival of Assad's regime. The Syrian littoral is a vital base for enhanced Russian naval presence in the eastern Mediterranean, and this preceded Russian air participation in the Syrian civil war. In addition, Russia wants to protect energy prospects that depend on Assad's survival. It already has signed exploration contracts with the Assad regime with regard to the recent gas discoveries in the Levant basin. Syria has been an ally of Iran since 1979 – the longest alliance in the Middle East. The preservation of the Assad regime is critical to Iranian interests because Damascus is a linchpin to its proxy, the Hezbollah in Lebanon. Russia's efforts on Assad's behalf thus directly serve the interests of the Iranian regime. If successful, those efforts will further Iranian influence in the region. With American credibility waning, traditional U.S. allies are beginning to hedge their bets. Outside Syria, we may see Iran join Russia in supporting Kurdish political ambitions in order to weaken Turkey, Iran's rival for regional leadership. The Kurds are a thorn in Turkey's side. Iran and Turkey are supporting opposing sides in the civil war in Syria, where the Kurds are carving out autonomous regions. Depending on how the war transpires, Kurdish national dreams might benefit from the power vacuum created by the disruption of the Arab statist structure and the American exit from the region. As to Egypt, American reluctance to support the al-Sisi regime plays into Russian hands. The Russians are selling weapons to Egypt, negotiating port rights in Alexandria, and supplying Egypt with nuclear reactors. In Iraq too, we see the harbingers of a Russian presence in coordination with Iran, as American influence in that state continues to wane. The rise of a more aggressive Iran – a direct consequence of the US retreat – may bring about greater tacit cooperation among Egypt, Jordan, Saudi Arabia and Israel. The big question is whether Turkey will join such an anti-Iranian alignment. US weakness in the region inevitably will have ripple effects in other parts of the globe. American credibility is now subject to question, and allies elsewhere may determine that it would be wise to hedge their bets. Greater challenges await the US beyond the Middle East.